No need for Chinese take out when you can cook your own at home. In a skillet heat oil and melt butter over medium heat. Add onions, celery, salt, pepper and crushed red pepper, cook until crisp tender, about 5 minutes. Move vegetables to the side of skillet and stir in beaten egg, stir until set. 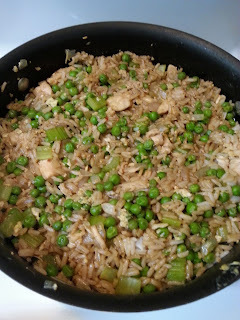 Add chicken, peas, garlic, rice and soy sauce, stir well and cook about 5 minutes, or until heated through.